A unique piece of artwork displayed outside the Market Square in the downtown core of Saint John, New Brunswick. Before entering the Market Square in the downtown area of Saint John, New Brunswick, be sure to stop and admire the artwork on display. Statues sit around the base of the tower, while others are situated around the top. Artwork outside the Market Square in downtown Saint John, Bay of Fundy, Fundy Coastal Drive, Highway 1, New Brunswick, Canada. 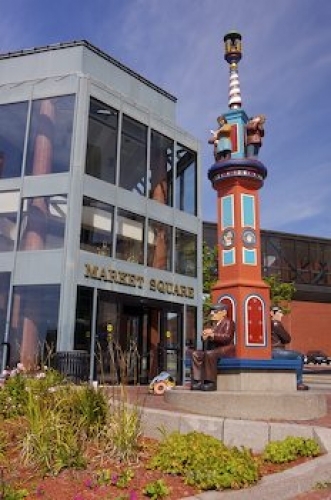 Picture of outside artwork at the Market Square in downtown Saint John in New Brunswick, Canada.